Faith: Faith keeps us happy, and so it should be protected. We are sad on the days when our faith has been slightly shaken-up. Egoless-ness: Egoless nature of mind should be protected, because it is the egoless-ness of a person that gives him value. Self-control: Our self-control should be protected because it is the self-control of a person that makes him a master everywhere. Angerless-ness: Angerless-ness in our nature should be protected. Bhakti: If Bhakti is not there in a person, he has doubt on Lord, and then he is not able to remain quiet. Equanimity: If a person has lost his equanimity, he becomes incapable of doing any work. Our whole life passes in acquiring and protecting that which is bound to be lost. When we leave the world, all the outer things that we have protected also leave us but the inner thoughts, about which we seldom care, stay with us. It is not easy for the inner development to take place. Unless the Lord wills, our inner thoughts won’t grow. For one big vritti to grow, one needs some outer situation. To have peace, you need someone to tell you how to have peace; to have Bhakti, you need some outer situation to usher you towards Lord. Virtues don’t come unless God wills. You can’t force a virtue in your life. The virtue of faith would not come unless there is a center of faith in your life. Faith comes when you hear satsang, when you hear the leelas of God. Faith comes when something miraculous happens in your life which you had not expected. If a person has experienced Godliness in his life, then his faith grows. Every emotion needs nourishment through something. Each emotion to grow, there has to be a divine intervention. You will never have dispassion unless you were attached somewhere and you got the bitter fruit of attachment. Just by listening, dispassion won’t come. If Bhagwan places you in such a situation where you were too attached and obsessed, you gave all your time, money, and energy, but you got nothing out of it except for sorrow then dispassion grows. If God doesn’t want to make you detached, he will keep-on giving you joy through someone and he will deprive you from satsang, and ultimately sorrow would be there. If Lord is not instrumental, our beautiful emotions cannot grow. We need our inner vrittis to be protected; our dispassion, character, love, purity, chastity, compassion, devotion to be protected. And who can protect other than Lord Shiva? Lord Shiva is present in three forms – Guru, Vishwas (Faith) and Lord Himself! Therefore His vandana (prayer) has been done in this Mangalacharan. Let us offer our prayers to Lord Shiva, who is auspiciousness incarnate. “Yasyanke cha vibhati bhoodhara suta”: On the lap of Lord Shiva is Mother Parvati. Parvatiji is Shakti (Power) and Shakti will always be with Shaktimaan (Powerful) only. Infact Shakti and Shaktimaan are one only. “Devapaga mastake”: On the matted hair of the Lord there is Devapaga, means Gangaji. Gangaji symbolises compassion; Ganges flows only to nourish the people around. 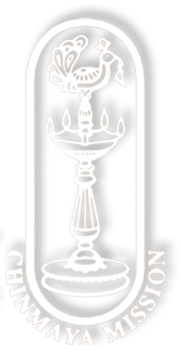 “Bhale baala viduhu”: On the forehead of the Lord is the small Chandrama (moon). The Chandrama had got a curse from his father-in-law to decay, and so he did tapasya. Bhagwan was pleased with him and gave him a place on His forehead. Anybody who worships Lord Shiva with devotion, Lord keeps him close to Himself. 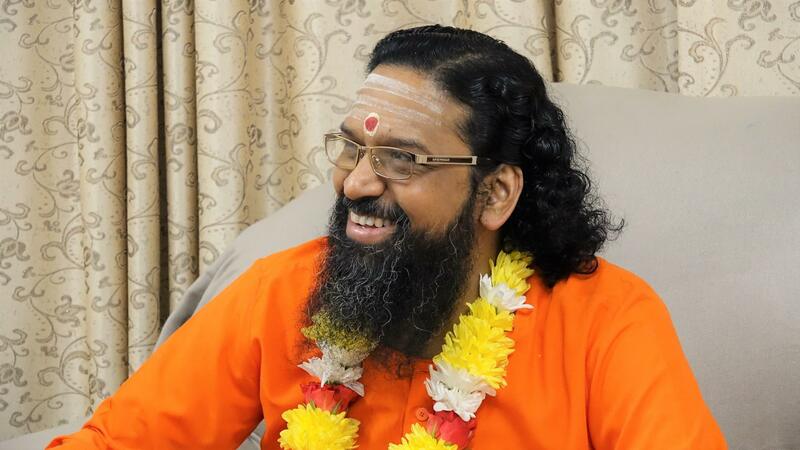 “Galecha garalam”: On the neck of the Lord is poison. This indicates that we must learn to drink poison in our life. Poison i.e. bad words, bad situations etc. should not be taken to heart, because the Lord resides there, nor should they be taken to the mouth otherwise we will become bitter. “Yasya urasi vyalarat”: On the neck of the Lord resides the snake. Vyalarat means king of snakes. Snake represents death, thus having snake as His ornament only signifies that the Lord has conquered death as well. “Soyam bhuti vibhushanaha”: Lord Shiva has vibhuti all over His body. Shivji is fond of vibhuti especially of the cremation ground. Vibhuti signifies that the world is nothing but dust. Thus, from his eyes of discrimination and knowledge one who has burnt the world, for such a person vibhuti becomes His ornament. Shivji’s ornament is His dispassion. Dispassion is an ornament that makes a person look beautiful because it makes a person free and a free person alone is lovable. On the other hand, attachment makes a person ugly. Anybody’s centre of problem is his centre of attachment. Burn the attachment and see how beautiful is the dispassion. There is no essence is this world. Before anybody leaves you, you leave them; not externally but internally. “Sarvadipaha sharvaha”: This means that Lord Shiva is the Lord of all. And ‘sharvaha’ means He is the samhaar karta, destroyer of all. He pervades all and is the most auspicious. “Shashinibhaha”: The complexion of the Lord is white and bright as the moon. It is said that Vishnuji was fair and Shivji was dark and both contemplated on each other. Due to deep contemplation Shivji became fair while Lord Vishnu became dark. Tulsidasji prays in Mangalacharan that, “May the glow on Lord Ram’s face always give me beauty and auspiciousness.” Bhagwan Ram’s face never lost its luster, despite the situations. When He was asked by the preceptor to take the throne of kingdom, He wasn’t overjoyed; and when Mother Kaikayi asked Him to go to the forest, He didn’t become sad. Bhagwan Ram had so much quietude, serenity, and equanimity, that merely by remembering Him, one can become quiet. The beauty of a person is how less he gets affected with the outer changing situations. A person should be affected only by the grace of God and the words of Guru; he should not be affected by the twists and turns, ups and downs of the situations. An ahankaari person (egoistic) – An ahankaari person has an imagination as to what the other person should understand him to be like, and when his imagination is pricked, he gets wild. All ahankaari people are unbalanced people. An attached person – People who have extreme attachment are not able to take the shocks from the person whom they are attached to. Wherever we are attached, the degree of our wants is very high; it is so high that it can never be fulfilled, and when it can’t be fulfilled, we lose our balance, our quietness, equanimity, and fortitude. An angry person – The third type of people who lose their balance are those who are angry, complaining, hating and reacting. They make a very strong picture about others in their mind and want others to behave as per their wish. The problem with unbalanced people is that their decisions are erratic, and responses are absurd. The beauty of character of Bhawan Ram is that not a single incident is there where He acted impulsively. When a person has equanimity, he is very much amiable and available. We all are born with a lot of samskaars, such as anger, desires, anxiety, frustration etc. Anyone who is an honest seeker would say that his nature is terrible at times. When nature is not okay, a person makes lots of mistakes; and when he makes mistakes, he gets sorrow, and then he commits more mistakes. In this way, he lives a blind life, going from birth to death, death to birth and so on. It so happens that when a person does some punya (merits) in some birth, like he serves his parents or the country, or does some puja, path, etc., and the God feels for him that ‘he should come back to Me,’ then God gives a return ticket for him in the hands of some Mahatma. In the mind of that Mahatma, Bhagwan puts a seed as, ‘Liberate him! Make him free from all sorrows forever. 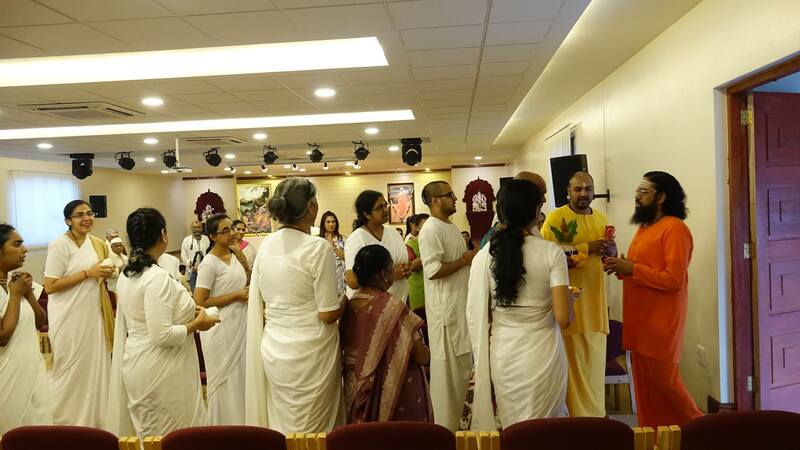 Allow me to take Avatar in you.’ In the mind of the jeeva, God puts a seed as, ‘Surrender to the teacher.’ This happy marriage of ‘grace of teacher’, who is the groom, and the ‘shraddha (faith) of the disciple’, who is the bride, is called ‘Deeksha’ from the teacher to the disciple. As against the people of the world, who are concerned only about superficial things and ask only mundane questions, when a teacher sees the disciple, his questions are, ‘Is your mind quiet? Is your anger under control? Have you done your japa? Was your meditation good today? Hope you are not getting attached anywhere.’ And if the teacher sees the disciple to be attached, to be uncontrolled, or prone to anger, then the teacher goes through a lot of pain, and this pain when it translates to remove that fault, it is called ‘compassion’ (kripa). 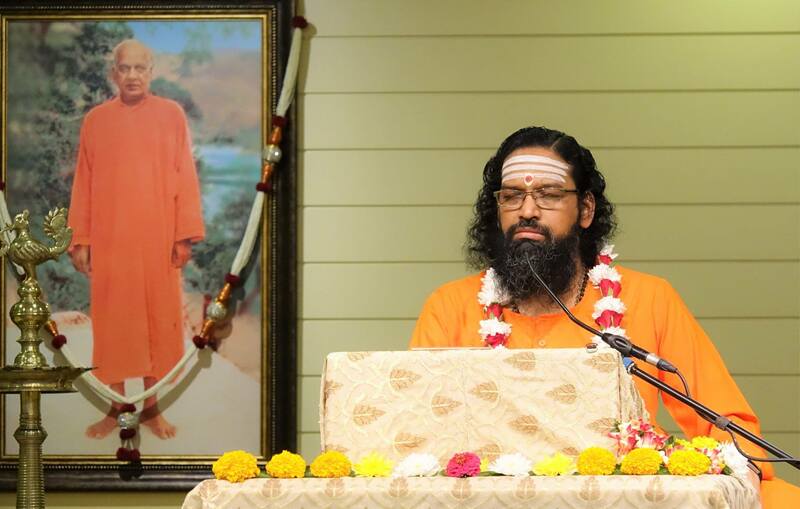 Guru-bhakti comes in a disciple only after seeing the commitment of the teacher towards him. The teacher is more devoted to the student, than the student is to the teacher. After the student realizes how much he has progressed because of the teacher, he wants to offer his whole life in serving the teacher and pleasing the teacher. 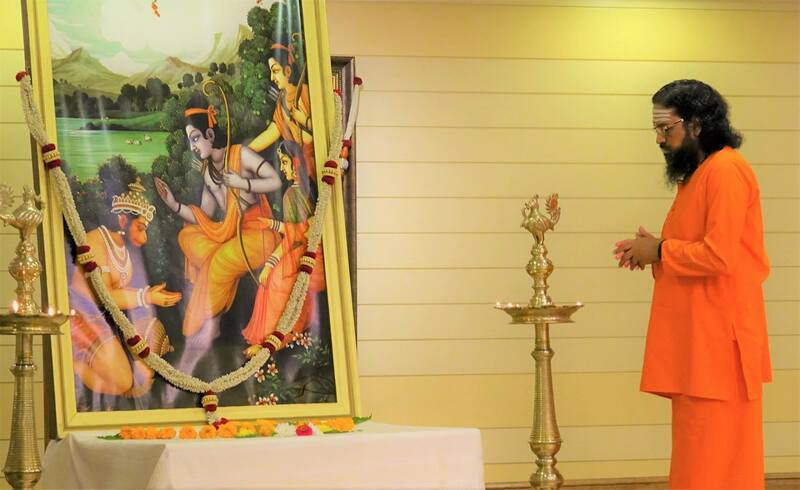 The mere presence of the Lord Ram melted the hearts of everyone. Whose very name delights a seeker, what to say if He Himself was present. The four main qualities of the Lord were: His roop (beauty), guna (quality), sheel (conduct) & swabhaav (nature). Roop: Lord Ram was the most handsome; He had a beaming face, delightful demeanour, quiet eyes and long hair. Anytime Bhagwan Ram passed through anywhere, everyone used to leave their work and just gaze at Him. Guna: The qualities of Bhagwan Ram were such that He accepted all. He was Purvasmit and Purvabhashi, i.e., upon meeting any person He did not expect that the other person should smile or salute first rather He smiled and saluted first. His eyes had immense compassion. Sheel: A person is known by what sheel He has, how he talks, how he addresses, how he walks, how he is in front of elders. In Balakand, it is written that if Bhagwan Ram wanted to leave in front of His Guru, His eyes first used to seek permission from His Guru. Such was His sheel. Swabhaav: One whose Swabhaav is good, people get attracted towards him, they want to spend time with him and talk to him. Bhagwan Ram’s swabhaav was such that anyone He met, He made the other person feel honoured. He never raised His voice in front of anyone. Fulfilment of any ‘activity’ is that it should culminate in ‘no activity’. ‘Active selfish’ life should go to ‘active selfless’ life, and ‘active selfless’ life should go to ‘inactive selfness’ life. A time comes when a person is supposed to lead a somewhat action-less life and meditation-full life; one where he can sit down and do puja, japa, and meditation for hours. The criteria of success is not how much we have worked, rather the criteria is, after working what is the condition of our mind…do we experience quietness, dispassion, devotion, and Guru-bhakti or not? If such qualities dawn after work, only then the work is successful. All our life, including the golden years, if we keep working at the same pace then it is nothing to be proud. As per the shastras, it is the failure of action. Success of action is in discovering quietude within, so that you are not running and rushing to go out in the world. When Bhagwan Ram got married and returned to Ayodhya, at that time, Goswami Tulsidasji says that in a congregation, among all his ministers, King Dashrath looked himself in a mirror and noticed some grey hair. He, almost immediately realized that it is time for him to withdraw. Dashrathji thought that his grey hair were, as if, giving him a sermon that he should make Bhagwan Ram the crowned prince and have the joy of seeing him on the throne. Dashrathji, on having thought of giving the throne to Bhagwan Ram, before expressing his feelings to anyone else, directly went to his Guru, Vashishtaji. Dashrathji expressed his wish in front of his Guru and said, ‘Those who put the dust of teacher’s feet, they control the whole world. With all my power and might, I will serve you. Whatever I have got is because I worshiped the dust of your feet.’ Dashrathji had made his Guru very happy through his selfless and desire-less actions. When Guru is happy with you, you get everything in life. Bigger is a person, bigger is his devotion, and more is the devotion towards the teacher, more the teacher blesses. Whenever the disciple’s thought comes in the teacher’s mind, there should be a flow of good will and blessings from the heart of the teacher. The disciple’s success is the conviction in the teacher about the disciple that he can go to any extent to fulfill the teacher’s orders to give him joy and obey him. When the teacher prays for the disciple, then no power in the world can stop God from answering the prayer. But to enter into the prayers of the teacher is possible only when the student has gone through some pains to give joy to his teacher. You can’t give joy unless you have gone through pains – physical pain, emotional pain and giving up of ego. You can’t love someone, you can’t surrender to someone unless you leave your own life, your own joys and sorrows. Ishwar loves us only through teacher, and we also have to love the Ishwar through the teacher. Ishwar doesn’t come directly as Ram or Krishna to love us, He loves through someone; you have to love Ishwar through that person only. Without Bhagwan Ram, our regrets, our sorrow, anxieties, worries won’t go away. When we have faith and devotion, we have a nice cushion where we can lie down and relax. ‘All will be fine, everything will be alright because I am taking Lord’s name, and I have surrendered to Him.’ If Lord is taken out from our lives, then we will become very anxious about everything. In nobody’s life everything is perfect at all times. Some wounds are always there in everyone’s heart. But if we have Bhagwan with us then we accept everything with love because we know that it is Bhagwan who has given it. This is called Bhajan. Unless you bring God in all your experiences, the experience will not give you that much joy. Bhajan means – through your actions, you do ‘Puja’; and whatever you receive, good or bad, you accept that as ‘Prasad’. ‘Oh Lord! I accept everything. You have given me so many good words, and if you give some bad words, I will accept it too. As the Lord will keep me, I will live accordingly. Whatever I will do, will be to please Him.’ This is Bhajan. If you think like this, then your mind will become quiet. When Vashishtaji went to the palace of Lord Ram to give the news of His coronation, Bhagwan Ram ran to greet him, and offered shodashopchaar puja with a lot of love. Bhagwan Ram had a lot of bhaav for His Gurudev. One who has bhaav, he alone can do tyaag (sacrifice) and seva. Ramji was not very pleased to get the news of His coronation, as He felt that His brothers were more deserving and capable than Him. This was Ramji’s sheel. Those who have a lot of joy within, they don’t want somebody else to give them joy. Lord Ram was not desirous for the Kingdom. Here Goswamiji says that this regret of Bhagwan Ram should take away the crookedness of the devotees. The celebration of a jeeva starts on that day when he wants to offer everything to the Lord. Even if he is not able to offer, but that desire itself marks a new era in the seekerhood. When a person lives a righteous life of quietness and sacrifices, at a certain stage, he evolves to a state when he wants to give-up all his belongings and go for a meditative and contemplative life. The progress of a person is known by how much he has gained the capacity to give-up his attachments, his ahankaar, temptations, and position, and how much time he spends in solitude. All duties towards the world should culminate in duty towards the Lord and the Atma. Duties are a good vehicle but a bad destination. The Duty of the world is not for the world, it is meant to culminate in duty towards the Lord alone. Bhagwan Ram, upon receiving the news of His coronation did not get joyous. He could have thought ‘I became a King,’ but His intentions were always flawless, non-malicious and selfless towards all situations. A person is as lofty as his thoughts. A very big wealth of a person is that, in his life he should try to purify his inner thoughts more and more by using the element of sacrifice. A great person is great because he thinks and acts to enhance the greatness of others too. Glory of Bhagwan Ram was that, anybody who came in His contact became bigger, whether it was the monkeys or the demons or the tribal. He didn’t invoke ‘heen bhavana’ (smallness or pity) in anybody. The glory of Bhagwan Ram was that He didn’t want to be big alone. An ordinary egoistic person loves to see himself bigger. When a person has ahankaar, he feels that his place should be unique, he should look unique, he should be perceived unique etc. The glory of a selfless person is that he thinks – let everybody be happy, let everybody be respected and honored. When everyone in Ayodhya came to know about Lord Ram’s coronation, all the childhood friends of Bhagwan Ram went to greet Him. To meet every person, Ramji stood up, embraced and spoke in a soft tone. When we talk, the sweetness of heart should come out and our inner beauty should be reflected so that the other person feels like listening. Ramji’s nature was such that His friends felt there was no one like Ram and wished to become His servant in every birth. Even the smallest squirrel, when it came in the hands of Bhagwan Ram, it started expressing its happiness by dancing on His hands. The beauty of a person is not that he decorates himself, or puts himself at a very high pedestal, rather the beauty is that he makes others feel comforted and valued in his presence. Upon knowing the reason for the festivities in Ayodhya, Manthara, who was the maid servant of queen Kaikeyi, got very upset and started thinking how can the coronation of Ramji be stopped. The nature of an un-saintly person is that he gets very upset upon seeing other’s joy. He cannot see other’s glory, goodness, well-being and progress. Manthara was chosen by the devatas to do such a job because she was a person with very bad intentions. When God has to execute some bad plan, He finds the apt bad person to execute it. When Manthara cried in front of Kaikeyi and threw tantrums, then instead of driving Manthara out, Kaikeyi kept asking the reason for her distress. That was the biggest mistake of Kaikeyi. She shouldn’t have allowed her weakness to come out. One should be very firm in his devotion and right convictions. Instead of surrendering to the God and the Guru, Kaikeyi surrendered to a crooked person like Manthara. It is very easy to induce doubt in a person, but it is very difficult to bring faith. The moment one has jealousy and attachment, a person becomes vulnerable. Kaikeyi had inferiority complex with Kaushalyaji. Manthara brought out the weakness of Kaikeyi. Nobody can bring-out any weakness, unless we already have it in us. When, in action, ‘bhed-buddhi’ (thought of separateness) comes i.e., the thought comes that ‘your joy is not my joy, and your sorrow is not my sorrow,’ then the person becomes very small and cheap. As long as your sorrow is my sorrow, and your joy is my joy, we can enjoy each-other’s company, but moment our joys and sorrows are separate, we become very narrow-minded, closed-hearted, and unhappy. This alone is the cause of any strained relationship. Upon knowing that Kaikeyi was in Kop Bhavan (Anger room), Dashrathji was startled and afraid. When the attachment is too much towards someone, we cannot see the other person angry. Kaikeyi was beautiful and intelligent, she had done sacrifices for Dashrathji and also loved him; it is very easy to get attached to such a person. 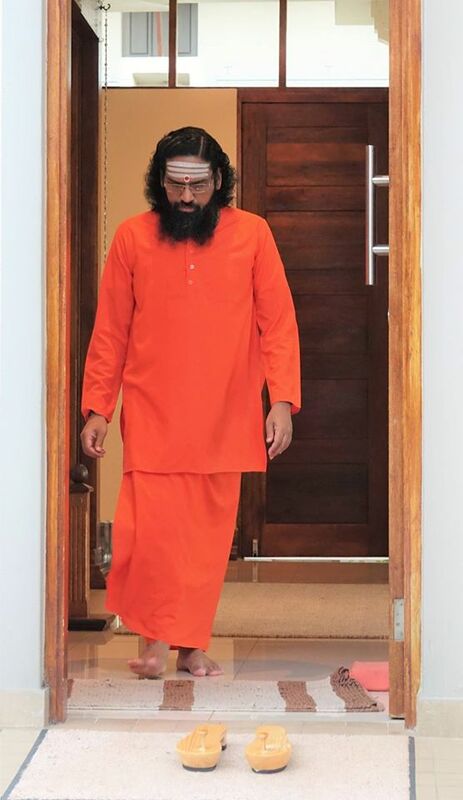 Here, Goswamiji says, one who cannot be hit even by the thunderbolt of heaven, he can be devastated by Kaamdev’s arrows. Such is the force! When Kaikeyi told Bhagwan Ram about her two boons: 1. Giving the kingdom to Bharat and 2. Ramji to go to forest for 15 years, Ramji simply smiled. Where we would have been devastated, Ramji smiled. Bhagwan thought, “This mother has always loved me so much. If she embraces me once, it will be forever; if I honour her once, it will be forever. 14 years is a small time. I will never take away the place that I have given her.” One who has an ocean of joy inside, for him a little lessening of joy outside doesn’t make a difference. Soft and beautiful words were the ornament of Bhagwan Ram’s speech. In life, many-a-times, there is a flood of unexpected situations. Everybody’s experience is that many circumstances turn out to be much more difficult and tedious than what he had expected. Life doesn’t come straight; it brings a lot of problems and calamities. When problems come, they don’t ask us if we are ready to face them or not; they simply barge the gate open and try to crush us. The beauty of living is, howsoever big the problems and sorrows may be, they should appear nothing in front of our mind. A person is known by the quietness of his response in the most difficult and tedious situations. See Bhagwan Ram’s response – the shine on His face increased when He was asked to go to the forest, to live in the jungles like rishis and munis, and survive on fruits, when only a few moments ago He was getting ready for the coronation ceremony. Absence of Ahankaar (ego): When a person doesn’t have ahankaar, his responses are quieter. But when a person has ahankaar, he reacts very sharply to the situations; he has a very stiff mind and he wants the situations to follow his mind. When something doesn’t follow his mind, he gets devastated and then his reaction is bad. When there is ahankaar, even the smallest incident can become a terrible incident of life. Absence of Attachment: One who has detachment, he doesn’t suffer upon losing something. He doesn’t cry because he has attachment with none. If somebody says to you that he is taking mud from your house, you would not react to that, similarly, one who has detachment, for him everything is like mud. For us, a little thing is enough to shatter and shake us, and disrupt our inner fabric. Our mind is very reactive because we live with a lot of insistences and a lot of attachment to certain places and people. Your joys and sorrows are as per your interpretation. What situation will come is not in your hand but what you will think about the situation is in your hand. Every situation wants to give you so joy, maturity and peace of mind. If tough situations don’t come, we won’t get mature. Bhagwan Ram said to Kaikeyi, ‘In the forest, I will meet saints and sadhus. And on top of that, you will be happy, father will be happy, my brother Bharat will become the King, what more I want?’ Bhagwan Ram had so much renunciation within that it didn’t matter to Him at all. What is a sadhu’s quality? Take anything away from him – people, place, time, money, he will be fine. Even if you take away his body, he will be fine. Who will be a bigger sadhu than Bhagwan Ram. ‘Samsaari’ (worldly person) is the one who holds on to many things around, and many strings are attached to him, and even if one string has been tightened or taken away, he gets shattered. Bhagwan Ram could smile where an ordinary person would cry. Bhagwan Ram’s interpretation was – ‘For such a small matter, why my father is so unhappy? If he is shattered, that means I must have made some mistake.’ This was Ramji’s humility. Arrogant person always points out others mistakes, but a humble person tries to find where he must have gone wrong. Bhagwan Ram was very well prepared and that is why He could play it so well. He responded as if nothing had happened, as if somebody simply took away a blade of grass from him. Ramji’s smile never disappeared in adverse situations. A seeker is the one who prepares his mind like Ramji’s mind to face even the worst with absolute quietude. That preparation is absence of ahankaar, absence of attachment and presence of my sharnagati (surrender). He prepares himself through satsang, puja, japa, sadhna, solitude and company of saints. It is an important project to make our mind like Ramji’s mind. Bharatji will get the kingdom. Any role demands a lot of sacrifice and bigger is the person with whom you are associated to, more is the sacrifice required. Every duty demands to leave something. No role is easy; in every role there is silent call to sacrifice the lower for protecting the higher. If Ramji had not gone to forest, people would have said, for the sake of comfort, Ramji did not go to the forest. You are somebody’s love because you have given a lot to him without asking anything in return. If anybody has not sacrificed for you, you cannot love that person. One tune, one music that comes out from all dharma is tyag (sacrifice). Those who give-up they alone get a big reward. They are never at loss! We all want joy, happiness and security in our life, but we should understand that these come only from one thing and that is ‘dharma’. A house is bound by dharma; a relationship is sustained by dharma; an institution is happy because of dharma. In Valmiki Ramayana it is said, ‘Ramo Vigrahavan Dharmah’, meaning ‘Shri Ram is the manifested form of dharma’. Dharma is not easy because in following dharma a person is expected to sacrifice the joy of his vasanas. We all love to do what we like, and thus many times we don’t do that we ought to do (i.e. our dharma). It was the dharma of a son, but it was very difficult. Some dharma are little easy, and some are very difficult. Sometimes people follow easy dharma, but when it comes to difficult dharma, they don’t follow. But if someone is able to walk on the difficult path, then that dharma gives him immediate strength and quietness. Bhagwan Ram showed to the humanity that even under the dire situations, one should not leave his dharma. Dharma makes the person not only secure in the near future, but his next birth too gets better. Dharma gives you dispassion and the power to renounce because when you perform any dharma, you have to give-up something, you have to give-up your laziness and ego to begin with. Bhagwan Ram had to give up His royal attire, His comforts, His attachment to the kingdom, He had to give-up his near and dear ones. There is no moment in our life where some kind of sacrifice is not required. Life is that where each moment demands ‘giving-up’, sometimes give-up anger, sometimes attachment, hatred etc. More a person is able to give-up, more he becomes closer to God, and more he is fit for renunciation. When we talk about dharma, we are not talking about vrat (fasting), Satya Narayan kath, or offering water to Tulsi plant etc., all that is ‘Upasana’. Dharma is where your role is involved, your doer-ship is involved, and where you have to respond at an emotional, intellectual, physical, intentional and spiritual level. Dharma is when these five kinds of responses of a person create happiness and purity of mind, thereby pleasing God and creating dispassion. On the other hand, if you follow adharma, insecurity will come, people will be unhappy with you, there will be disappointment, and ultimately you will not be happy. Result of dharma is that people trust you, the situations become quieter, and you are happier within. Actions are not over after they are completed physically. You keep remembering certain actions. Some actions, which you may have done 10-15 years ago, still they are fresh in your mind. 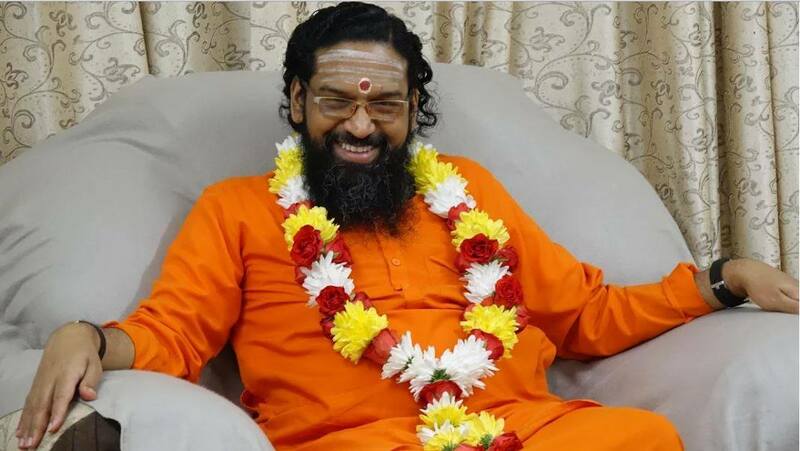 When you are acting, you are in the impulse, and you don’t know whether your action is right or wrong, but when action is over, and time has gone, and you are a quiet person, and listening to satsang, at that time when your sattva guna has increased, at that time you discover that the action what you did was adharma. When a person does dharma, his actions don’t come to haunt him. The karma of adharma doesn’t leave you mentally. You have to carry an additional load in your mind. Sitaji wanted to be with the Lord, to serve Him in the forest. Those who have ananya bhakti, the very thought of sorrow of the beloved troubles them. Those who have ananyata, day and night only one sankalp is there, ‘how my beloved can be happy, how I can offer myself.’ One cannot love without sacrifice, as the soul of love is sacrifice. There is something called Swadharma. But all dharmas are to take the seeker to Param Dharma. If somebody is a mad lover of God, then he has no Swadharma. He has already achieved his Param Dharma. Gopis need not live with their husband because all worldly Dharma is meant to ultimately fulfil the Param Dharma only. Love is pure when you are totally identified. When Bhagwan Ram went to Mother Kaushalya to seek permission and blessings to leave for the exile, although she was very attached to Ramji, she thought that she may cry for her whole life but she would not become an obstacle for Ramji in performing His dharma. To become a good mother is very difficult because there are so many emotions in a mother and at the same time discrimination is also needed. Mother Kaushalya didn’t let her emotions over-power her discrimination. Such a deep character she had! It is said that when Ramji embraced Lakshmanji and asked him to seek permission from mother Sumitra to accompany Him, mother Sumitra permitted Lakshmaji saying, ‘Ayodhya is where Ram is!’ We must note how deep was the character of mother Kausalya, mother Sumitra, and Urmila, and how much they understood the situation, and were sensitive to the need of the person in front of them. The sacrifice of each individual was immense! Life should not be squandered away, life is meant to make Lord very happy and serve Him day and night. This is the privilege of human beings alone!